Valdosta school board member Annie Fisher pointed out CUEE members sent their chidren to private schools and now they're meddling in public education. She listed some real issues, such as Valdosta city schools remain segregated, focussing on tests just to meet AYP, and we need to remove students from the prison to the classroom. Yes, let's forget "unification" and focus on that. You thought maybe I made up the three points I proposed to improve education? Nope, unlike CUEE, I've been paying attention. 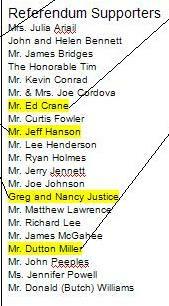 Here's the crossovers from the CUEE/Valwood donor list. It seems like being on the board or even publicly supporting a group dedicated to combining two public school systems while being a trustee or donor of the community's biggest private school might present a conflict of interest. Of the listed supporters on CUEE's website, there are three Valwood trustees, one of whom is a spouse of another trustee: Ed Crane, Dutton Miller, and John Peeples (whose wife Jane is also a trustee).